The rain is coming at me horizontally as I make my way to the temporary tee perched on a square of mud some 220 yards short of the winter green. My hand is so numb I can?t get it into my pocket to pull out a tee. I finally manage then look up to consider the shot. Well, the wind?s blowing at about 57 miles per hour into and off the left, the ground is still partly frozen so the ball may or may not kick on as if it?s struck concrete, add to this the fact I?ve got so many layers on that I?ll only manage a straight armed chop and it all seems rather tricky. Opting for driver I make a decent prod at it. The ball carries at least 180 yards before coming down in a patch or rough that has defrosted and plugs. Yes, golf through the winter is tough. Despite this I play during the colder months in all weathers, on all surfaces. I just can?t hang my clubs up. Every Wednesday between late September and mid March I compete in a competition called the Alliance. It?s basically a tour for professionals, the retired, the self-employed and the unemployed. I fit loosely into the penultimate category. About 100 competitors visit a different course around the region (North East Scotland) each week and stump up the princely sum of £12 to compete for a top scratch prize of £100. Amateurs receive their winnings in vouchers, pros in cold hard cash. 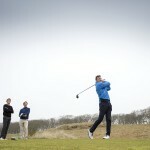 I travel with my two playing partners Stewart Davidson and Paul Cormack. Stewart is the assistant pro at my local club (Banchory) ? an excellent darts player, he?s also pretty handy on the golf course. He?s already recorded a few second place finishes in the 2006-2007 season and holds top spot on our private money list with Paul, who?s a very good player, second. He?s recently turned pro off a +2 handicap and had a stab at the first qualifying stage for the European Tour. Although he shot -4 for four rounds it wasn?t quite good enough so he?s dedicating his attentions to the prestigious Alliance for another winter. I play off three and rarely feature.